Scaly Leg is most commonly caused by Knemidokoptes - also spelled Cnemidocoptes, which are eight-legged microscopic mites that are related to spiders, ticks and scorpions - but obviously much smaller in size. They burrow in the feet and legs, but may also affect the vent and face. Scaly leg mites bore under the scales on the legs of the bird. Feet or legs have a crusty, scaly appearance, which may also sometimes appear around the vent and wing tips (as well as the face and beak). Legs / feet may look swollen. The claws may become overgrown and cracked. The scales may become infected. Heavy scaling and overgrown claws can result in lameness / reduced mobility, inability to perch and increased discomfort in the bird. 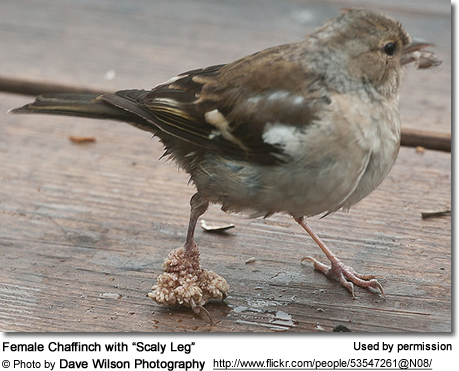 In Canaries, their legs develop thickened areas that look more like corns. 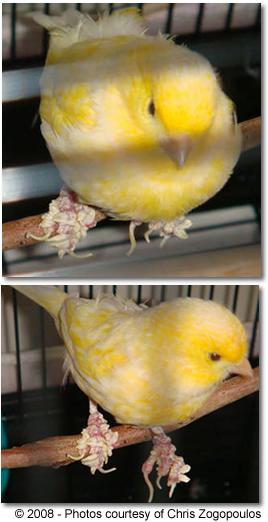 NOTE: Older canaries can naturally develop scaly legs that don't have anything to do with mites, but are instead an indication of a build-up of calcium salt between the scales of a canary's feet and legs. Younger canaries usually don't have these scales, although some canaries are susceptible to having the calcium salt metabolism problem their whole life. However, as a general rule, scaly legs in YOUNG canaries are most often (but not always) associated with scaly leg mites. The lesions typically develop very slowly, so that an infected bird may appear normal for a long period of time. Advanced cases have characteristic crusty / scaly lesions. Please refer to "Bird Nutrition" for food items rich in Vitamin B.